Stylish studio 'Suite César' in the heart of Ghent. 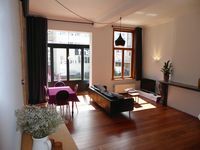 Property 11: Stylish studio 'Suite César' in the heart of Ghent. Cap's House Cosy - City centre! Property 15: Cap's House Cosy - City centre! In the very heart of the Historic Center, beautiful residence. Property 20: In the very heart of the Historic Center, beautiful residence. Historical Luxury, Heart Of Town! Property 21: Historical Luxury, Heart Of Town! Ghent furnished apartment with garage. Apartment was at a great location! Two blocks from the heart of Ghent. We loved staying there and it was easy to get to the train station. Apartment had everything we needed. Lots of coffee and tea and a grocery store around the corner. Lots of restaurants within steps. Was really great! High class apartment in the center of Ghent. The apartment had everything what we needed; clean, well-equipped; we had no problems finding apartment or parking the car near by. Special thanks goes to a host. Wouter really takes pride in his place and he shows that he loves having guests there. We felt very welcomed from the minute he greeted us, showed where everything is in the apartment and what is around it. We really appreciated his advice about local grocery stores and transportation from Ghent to Brugge for a day trip. Wouter was always within the reach for any questions, very accommodating and helpful. Thank you so much. We had a great stay in Ghent.